In Western culture we see many approaches to physical fitness. Among these are running, aerobics, swimming, CrossFit, team sports, dance, and the list goes on. A favorite of ours is the practice of Yoga, and it is becoming increasingly more popular for a reason. The benefits of Yoga include stress reduction, physical fitness, better sleep, improved communication, and a calmer state of mind. For many students, it helps to take on life with a more positive and open attitude. The difference between Yoga and a gym workout is that Yoga encompasses exercise, meditation, and pranayama (breathing) in one class. You may have preconceived notions that Yoga is “easy and Zen,” but the practice will totally prove you wrong. Not only does it tone the body in ways you’ve probably never seen with other exercise, it softens the mind to maintain the body’s natural Prana, or life force. Yoga quite literally balances the body and the mind. Most Yoga classes begin with centering and meditation in which the instructor helps students clear their minds by focusing on the movement of breath through the nose. Often, the instructor will explain how to set an intention for the practice and remind students to come back to it throughout class. This mindfulness practice helps create a safe, trusting space for students to practice asana, or postures. 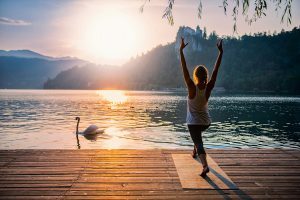 From the practice of mindfulness, some poses in Yoga are known to release emotions more than others, and it is not uncommon for latent feelings to arise during an asana practice. Instructors encourage students to express themselves and embrace any emotion that is present in that moment. At the end of Yoga classes, students lie still in Savasana, also known as Corpse pose. This can last anywhere from 5 to 15 minutes. During Savasana, the eyes are closed, the body is fully relaxed, and the palms face upwards. It brings closure to the practice, promotes deep relaxation, and helps the body and mind process the previous yoga poses to reap their benefits. As a form of meditation, Savasana can be considered the hardest part of the practice. Yoga brings us closer to our true selves and this awareness evolves with regular practice. If you haven’t tried Yoga before, it will likely have you hooked once you do. It is truly a different kind of workout; try it out! It may change your life in ways you’ve never imagined!